On Friday night, Gahlord grilled a steak from Laplatte River Angus Farm, along with corn-on-the-cob, plus potatoes, sweet onions and rosemary done up in a foil packet with butter, salt and pepper. We also had a salad of local arugula and romaine lettuce, with no dressing, because I was too tired to bother making any. Naked greens are good for you. Saturday's breakfast was very waffle-centric. I accidentally made a passable coffee substitute when I burned some black beans with honey — I just strained out the beans, added some hot water, and voila! Instant chicory flava. Not sure whether I'd want to recreate the experience, though: the drink was very bitter, and the built-in sweetener made it taste a little weird. I did add milk, but it might have benefited from more dilution with water. Definitely woke me up, though. 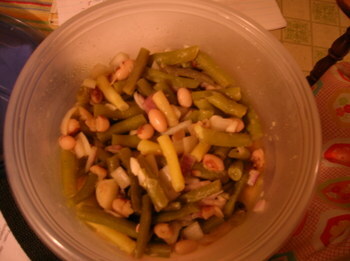 As you can tell, I experimented with black beans this weekend. 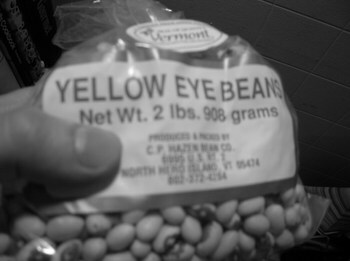 They don't respond to baking as well as the yellow-eye beans from North Hero that we've been eating. Slow simmering on the stove cooks them eventually, but it takes a very long time. Once they were done, we had savory black beans stewed with garlic, which I used as a base for huevos rancheros, along with leftover grilled corn cut off the cob, and some tomato-basil salad left from Thursday's potluck. I liked this way of fixing eggs so much that I had them for two meals in a row. 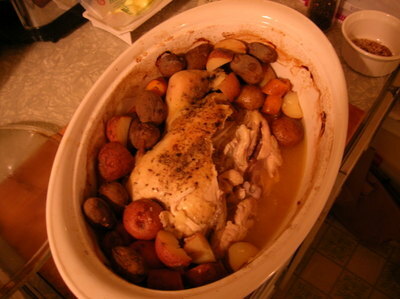 Yesterday afternoon I roasted a Misty Knoll Farms chicken with carrots, garlic and a variety of local potatoes. I covered the bottom of the roasting dish with about 1/3 of a bottle of rhubarb wine, another fine local vintage made in Cambridge at the Boyden Valley Winery. I usually add chicken stock to the pan as well, but I think it turned out OK with just wine. Sometime later this week I'll make chicken soup, unless it gets really hot again, in which case I'll freeze the bones for later. I find that I'm calculating meals more closely this month, because making one dish that lasts for three or four meals means I don't have to cook again during the week if I don't feel like it. Breakfast today was half of a Ginger Gold apple (they're huge!) from Champlain Orchards, cut up, with maple yogurt from Butterworks Farm. I also had half a multigrain waffle from last week's brunch, popped into the toaster and drizzled with maple syrup. I'm excited about the Ginger Golds — they seem very similar to Granny Smiths, an apple I use a lot in the kitchen because they don't turn mushy when cooked. I bought a bunch of these at City Market on Sunday, and German apple pancakes are a definite possibility this week. For lunch, I had cherry tomatoes with some of Saturday's black-bean-and-corn mixture and the heel of this week's Red Hen localvore loaf. I know we're picking up another Red Hen loaf tomorrow, but I keep baking bread: I happened to have some oatmeal and the dregs of a container of apple cider in the fridge yesterday, so I mixed it up with yeast, then with all-purpose flour, butter, milk and more flour to get a loaf with a much softer texture than last week's sourdough. Here's what it looked like while rising. We'll use this bread to trade or swap for other goodies this week, or else we'll put it in the freezer. One of the fun things about the Localvore Challenge so far has been seeking out ingredients I normally wouldn't need to look for. I love fresh mozzarella on summer salads, and was happy to find this stuff in the gourmet cheese section at City Market. At $7 a container, it's probably not something I'd usually buy, but given that I made one baseball-sized lump last through six meals, I think it was worth it. 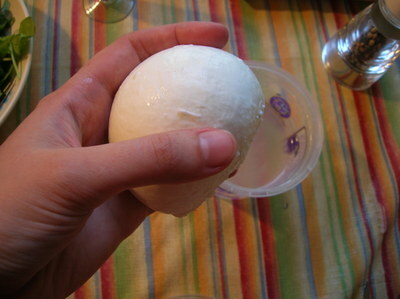 It tastes mildly tangy, but not a whole lot different from mozzarella made with cow's milk. If anything, it's a bit creamier, and not as stringy as some other varieties I've sampled. There's very little salt in it, which I like — I'd rather add salt myself, especially if I'm using the mozarella with food that I've already seasoned. Our localvore potluck is tonight, and I hope to try my first cake-bake of the month: carrot-cake cupcakes, with maple cream cheese frosting. I'll substitute either honey or maple syrup for the sugar: everything else I can get locally. Kudos to Melissa Pasanen at The Burlington Free Press for picking up on localvores in Monday's Living section. I wonder if she's participating in the challenge, too? Her week's worth of menus sound delectable, and I appreciate how they often use leftovers from a previous meal. It's great that Vermont's largest daily is encouraging people to try eating local for the remainder of the month, even if it's just one meal a day, say, dinner. Speaking of which, I've got to get cooking! Bread is one of the staples Gahlord and I consume almost daily, in some form or another: sandwiches, toast, croutons and crumbs. I used to bake it weekly at home for quite a while, but there are so many talented bakers supplying loaves in this part of Vermont that I eventually started buying bread at the store. It's been great to get my hands floury again. The sourdough experiment continues at a slow pace. 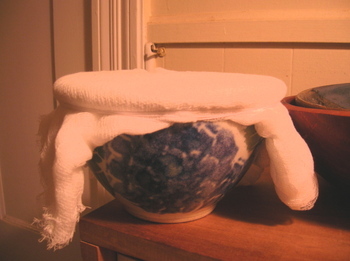 I kneaded some more flour into the starter and formed it into loaves two days ago, and covered them loosely with plastic wrap to rise, but they're not doing anything. They're really heavy. 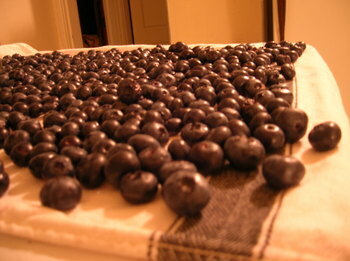 I think I'm going to dump them back into a bowl with some water and a bit more flour, mix it up, and see what happens. The Red Hen bread pickup went smoothly, so that's what we're eating right now. 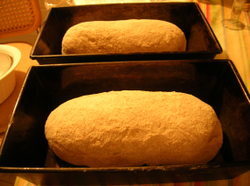 Each loaf smells heavenly, and contains 2.5 pounds of Gleason Grains wheat flour, grown near Middlebury. Each bread bag had an earnest note from the head baker stapled to it, explaining that while they feel that the Localvore loaf was successful within the limitations they had to work with, it's different from their other breads because the Vermont wheat is different, due to the soil and climate, etc. Red Hen usually buys wheat from Colorado. There's a very limited supply of wheat grown in Vermont, so Red Hen had to ration their flour supply carefully to be able to commit to offering a month of loaves for the localvore group. 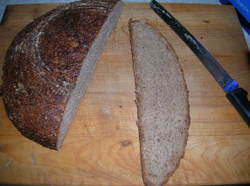 This bread (see left) is more dense, and a bit more moist, but I really like it. One slice, and you feel like you've had a meal. 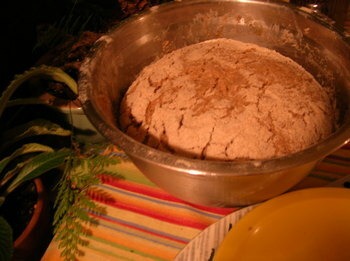 Some notes on what Champlain Valley localvores are eating, starch-wise: We have access to locally grown flour (all-purpose, wheat and rye), cornmeal, and oats. Locally grown new potatoes are now available in both area food stores and at farmers' markets, and I bought a gallon of locally raised popcorn at the Intervale kickoff potluck. That's pretty much it, but those ingredients can form the basis of many foods: oatmeal, pasta, crackers, dumplings, pancakes, latkes and, of course, bread. I love Japanese food, and I think if I tried to eat 100% local all the time I'd eventually miss rice, but I'm fine without it for a month. 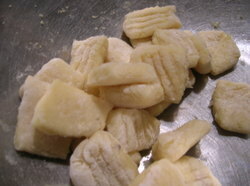 I made gnocchi for the first time two nights ago, and I have to say they're the best thing since sliced bread. Basically you boil potatoes, skin them, push them through a ricer, add a little bit of wheat flour and a beaten egg or two, then roll them out, cut them, and cook them briefly in boiling salted water. If I did it regularly, I think it would only take an hour from the minute I boiled the potatos to having little fork-marked pasta-dumplings on the table, but the process probably took me closer to an hour and a half. I made a lot, and we've been eating them with the ratatouille as a sauce. Yum. At last Sunday's kickoff meeting in the Intervale, our little subgroup of Burlington-area localvores (check out the blog!) all chipped in for a huge 30-pound bag of rolled oats, which is now sitting on one of my dining room chairs. People have been stopping by my apartment to dip out their shares. Not everyone has gotten their portion yet, but there's still a lot left — enough to fill a large laundry basket to the brim. What to do with all of this oaty goodness? My friend Allaire plans to host a huge granola-making party toward the middle of the month, and I expect we'll use a bunch of the oats then, roasting them with oil and maple syrup or honey, and maybe some dried local berries, if we can find any or have the patience to dry them ourselves. In the meantime, another friend has offered the use of a flour mill, so some people plan to make oat flour for baking cookies and biscuits, etc. 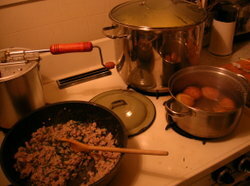 I have a Scottish cookbook with lots of oat-based recipies, and plan to cook some stuff from that. This morning, though, I opted for just plain-old oatmeal. Also for breakfast, I mushed up some blackcurrants with honey and boiled them for about 7-10 minutes, which made a pretty decent jam. I put that on some of the sourdough bread, toasted, and also had a glass of water. I'm really well-hydrated these days. I do have a gallon of apple cider in the fridge, but it usually tastes too sweet to me, to drink that often. Maybe I'll try watering some down to have with lunch. Lunch is really late today, but I plan to make a simple scrambled-egg sandwich on toast with salt and pepper, and maybe stick in some dill from our garden. I'll have an heirloom tomato bought from City Market on the side. Gahlord is taking one for the team, finishing up perishable leftovers that we still have in our fridge, even after last night's potluck where lots of food was consumed. It didn't seem to make sense to throw away good edibles just to claim localvore cred, so he's going to join me in the localvore diet in a few days. I tried not to be wistful while watching him eat a potato, mushroom and onion frittata this morning. Fortunately, I'd planned ahead and baked some bread with flour from Champlain Valley Mills, so I was able to have toast for breakfast, with butter and honey. A sprinkle of cinnamon made the toast even tastier. Topped off the meal with a bowl of blueberries in maple yogurt. Yum. For lunch, I packed a simple sandwich with more of the same bread and a hefty slice of Frog City Cheese. We met one of the cheesemakers a few months ago, when he came up to Burlington to market the brand, and it sounds like a really nifty operation. The cheese has small white grains in it; it's made in a traditional Vermont farmhouse style that is really flavorful, kind of like a cheddar. It was a bit surreal to browse the cheese company's website while eating its product. Two carrots I bought at the Burlington farmers' market and a bunch of plain, unadorned blueberries wrapped up the noon eats. Bread and blueberries, and plenty of water to drink. So far, not a particularly varied diet! 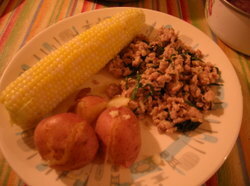 I hope to get to the store soon to see if I can have meat and potatoes tonight, with maybe a green salad. Lots of reasons! Several good ones are laid out here and here. This factoid particularly inspired Alisa Smith and James MacKinnon, founders of the 100 Mile Diet: 'When the average North American sits down to eat, each ingredient has typically travelled at least 1,500 miles.' When you think about it, that's a staggering amount of fossil fuel spent to schlep food that usually doesn't taste so hot once it gets to you. 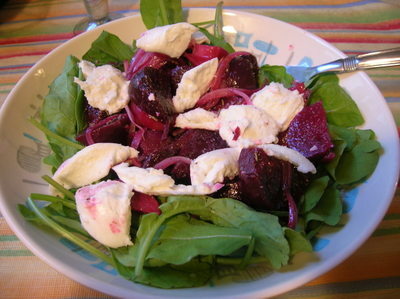 At a potluck back in midwinter, several of my sustainable-agriculture-savvy friends suggested it would be fun to try eating only local foods as part of the Vermont Localvore Challenge. My husband Gahlord and I decided to give it a go, partly because we love food and people, and the idea of mixing food and community on a daily basis was pretty appealing. The challenge runs for the month of August, and the goal is to eat only foods grown and prepared within 100 miles of our home in Burlington. To make this a tad easier and taste-tempting, folks can opt for the "Marco Polo" exception, which allows for salt and any dried seasoning a sailor could have carried in his pockets for 6 months or more. Our group of about 15 friends is taking the "Modern Marco Polo" exception, which means we're planning to use dried spices and salt, plus yeast, baking soda and baking powder. We're also continuing to use olive oil. Other modifications some people are allowing are "Caffeinated" and "Drunken" Marco Polos, which account for (you guessed it!) coffee/tea and beer/wine. The main point is to choose a plan and stick with it. More than a hundred folks have signed up to participate as part of the Champlain Valley localvore group, and there are two or three other VT localvore groups formally organized in the Mad River Valley, the Upper Connecticut Valley, and the Brattleboro area. There may be more, I'm not sure. If you know of any, large or small, please e-mail me or leave a comment. I'd also love to hear from (and link to) any other Vermont localvores who are blogging about their August experience. I hope to season whatever it is that I'm eating this month with thoughts about why local is good. The Daily Digest will be a 31-day record of where I found stuff, tasty recipes I've made or heard about, and new culinary tricks I've acquired. I've already learned how to make cider vinegar from apple cider, and I'm looking forward to some of the communal cooking events and recipe swaps planned for this month.